I discovered Oatly’s newly released product a couple of weeks back, it’s a oat based crème fraîche that is really nice in it’s texture and appearance. I’ve tried other oat based crème fraîche’s before from brands, however they’ve been grey and rather lumpy and thus unappetising in my opinion. 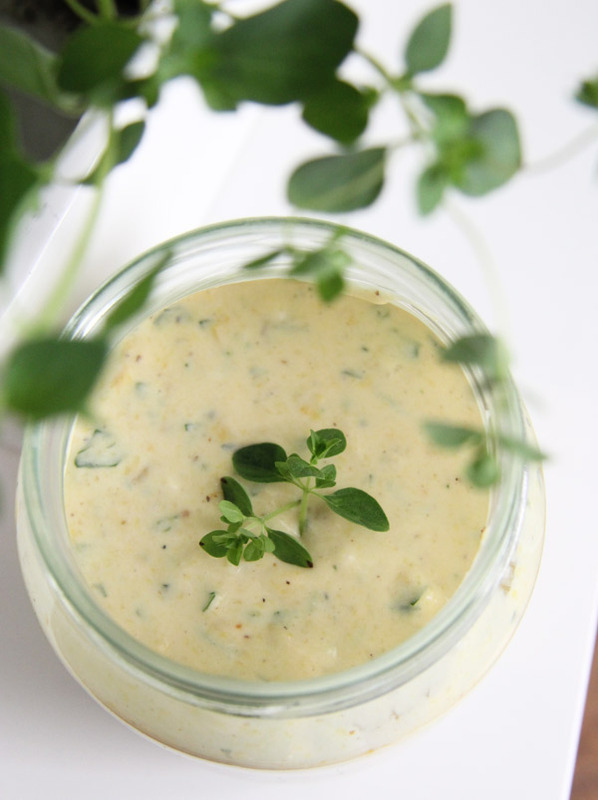 At a family gathering a couple of weeks back, involving a selection of barbecued veggies such as asparagus, mushrooms and aubergine, I put the crème fraîche to a test by whipping together this simple dressing. The result? really divine if you ask me! I reckon that if you have any leftover grilled bell peppers, the dressing will taste even better. Add bell peppers and garlic to a bowl suitable to use with a hand blender. Mix until as smooth as possible. Add vegan crème fraîche, some herbal salt and white pepper, blend until even. Stir in the chopped herbs and ensure the herbs are distributed evenly in the sauce. Taste and add additional herb salt and white pepper if desired. Let stand for a couple of hours in the fridge, prior to serving.